Last weekend marked the official beginning of spring racing for GRC, as a small contingent of the Club's track crew took their turns on the tartan ovals of Raleigh and College Park. This weekend, GRC runners will be out in force on the track and on the roads, springing to life alongside the blossoming flora and frolicking fauna. 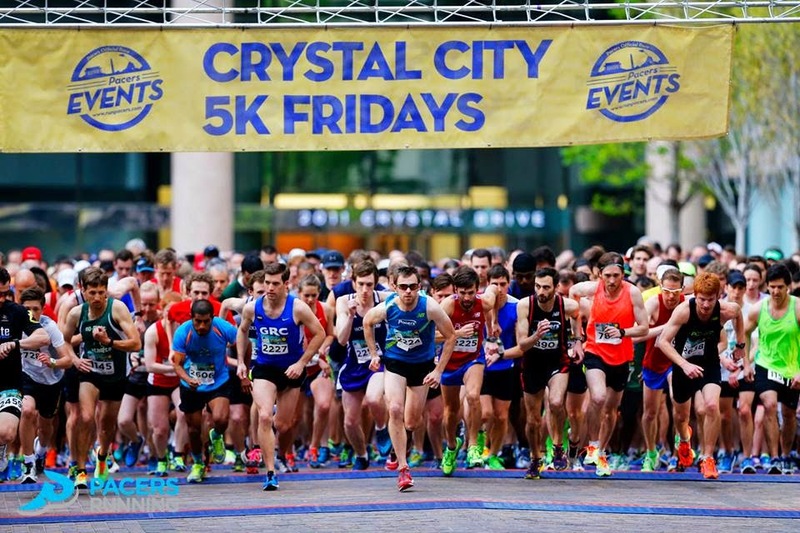 First up, GRC will kick off the spring road racing season on Friday in Arlington at 6:30PM EDT with the first race of the Crystal City 5k Fridays series, an opportunity generously organized by our sponsors at Pacers Running. Toeing the line for GRC on the women's side will be Laura O'Hara, Kara McCartney, Alyson McGonigle, and Olympic Marathon Trials Qualifier Emily Potter (who, pushing a baby stroller, will seriously up the ante of the race). Among the men out for the evening fun will be GRC's Kyle Cooke. Alyson, a 2015 graduate of and former middle-distance standout at the University of Richmond, will be making her GRC debut. GRC's Ryan Witters starts one of last year's Crystal City 5k Fridays races (Swim Bike Run Photo). Down south, GRC's early bloomers will return to the track in Williamsburg, Virginia for the 51st annual Colonial Relays at the College of William and Mary, led by Stephanie Reich in the Championship Women's 1500 meter run on Friday evening at 6:55PM EDT*. Steph is fresh off of her GRC track debut, personal best, and number two all-time GRC performance in the 5000 meter run at the Raleigh Relays. At Zable Stadium, she will look to notch her first mile-equivalent PR at the 1500 meter distance since high school. Judging by her recent performance, fitness is on her side. Joining Steph in Virginia's colonial capital will be a sizeable crew of men in the Championship 5000 meter run, scheduled for 8:20PM EDT*. Olympic Marathon Trials Qualifier Carlos "CJ" Jamieson will make his highly-anticipated official debut in GRC blue as he mixes it up with some of the Mid Atlantic region's collegiate best in the event. Carlos will have a good shot at notching a spot among the top five all-time Club marks, if not the 13-year-old Club record of 14:09. Accompanying Carlos will be Stewart Reich, happily reunited with his wife Steph after they divided and conquered the east coast track scene last weekend. Stew is ready to notch his first sub-15 minute performance at the twelve-and-a-half lap distance on the track, after barely missing his PR of 15:04 by a single second in a solo effort at Maryland. Also running the event will be Kyle Wagener, fresh off his GRC outdoor debut in College Park. Luk Olenginski, in his own GRC outdoor track debut, will toe the line on Saturday at 10:20AM EDT* in the University Men's section of the race. A live stream of the Colonial Relays will be available here; live results, here. *The official meet instructions indicate that events may run up to 15 minutes ahead of schedule. NOTE: The live stream is only available on Saturday, beginning at 1PM EDT. After a day of rest on Saturday, GRC will be back on the road, blowing pink petals off the Cherry trees around the Tidal Basin in their wake as the team musters for the annual premier fixture of the D.C. (and national) racing circuit that is the Cherry Blossom Ten Miler. The race gets underway at 7:20AM EDT with the Elite Women's start. The event will be broadcast live here. Some of GRC's biggest guns will be out in the sun for this race, including CJ, doubling back from his performance Friday evening, and rube Kieran O'Connor, returning to racing just over a month after his 24th-place finish at the U.S. Olympic Marathon Trials. Kieran will still proudly be sporting the single pair of running shorts he owns, and Coach Jerry has indicated that Kieran's race plan is to try and break 65 minutes in the event, in hopes of solidifying his place as a member of the B+ training group. On the women's side, GRC superstars Kerry Allen and Maura Carroll will lead the way, both on the hunt for fresh PRs. Kerry and Maura are well-prepared for the pancake-flat course at Cherry Blossom after their triumphant efforts over the hills of the RRCA Club Challenge Ten Miler in Columbia, Maryland just a short month ago and the hills of the Rock 'n' Roll DC Half Marathon two weeks later. Also out to steal some glory beneath the Cherry Blossoms will be GRC's Jerry "Outlaw" Greenlaw, Evan Jurkovich, Charlie Ban, Dave O'Hara, Chris Van Es, Paul Balmer, Matt "Fridge" Hassett, and Sebi Devlin-Foltz. 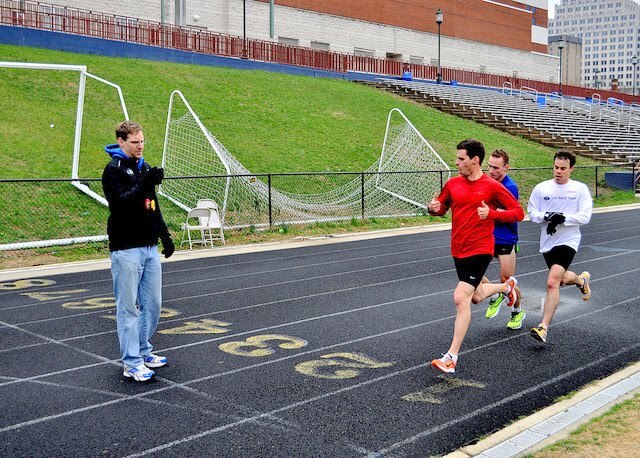 Evan has been steadily racing his way back to form after an extended hiatus due to injury. Fridge will be gleeful to escape from his PhD research, if only for another brisk ten miles. Meanwhile, Balmer will take to the Tidal Basin as part of his ongoing preparations for the Boston Marathon. 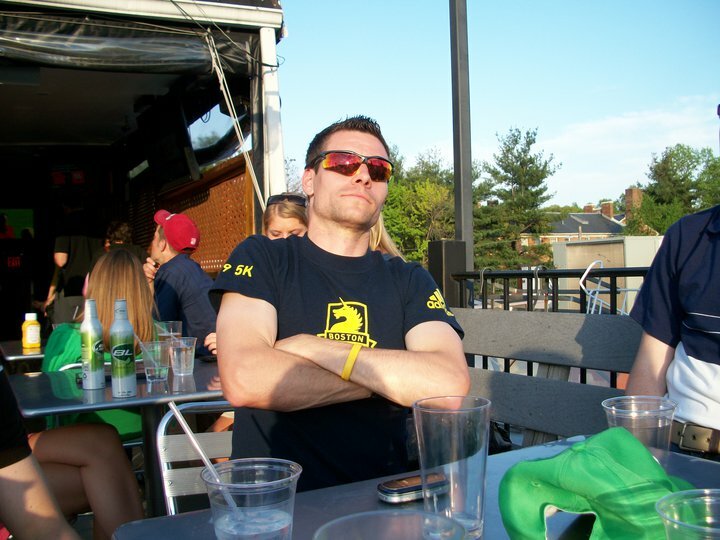 Notably, Dave O'Hara will celebrate his 40th birthday with his Masters debut at Cherry Blossom, and hopes to improve upon his third-place age group showing in the event last year. Challenging Dave's dominance in the Masters division will be some guy named Meb Keflezighi. Outlaw returns to Cherry Blossom coming off of an outstanding performance at the RRCA Club Challenge Ten Miler in February, where he led the men's squad to a runner-up finish over the extremely challenging course. For Outlaw, running the Cherry Blossom Ten Miler has become an annual fixture almost as certain as the budding of the trees and the flocking of tourists to those trees. Cherry Blossom was Jerry's first race after moving to the DC area in 2010 (but before joining GRC), and it remains his favorite race. This Sunday, Outlaw will look to continue his consistent showing as one of the top Americans" in the event, and hopefully snag a PR. 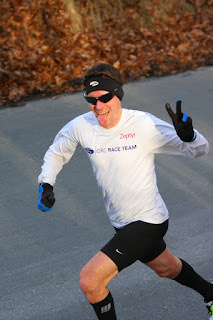 Old man Charlie Ban commented that this year's Cherry Blossom Ten Miler would be markedly different from the 2010 edition of the race, as he will be the only returning GRC stalwart in the event from that year's competition crew. 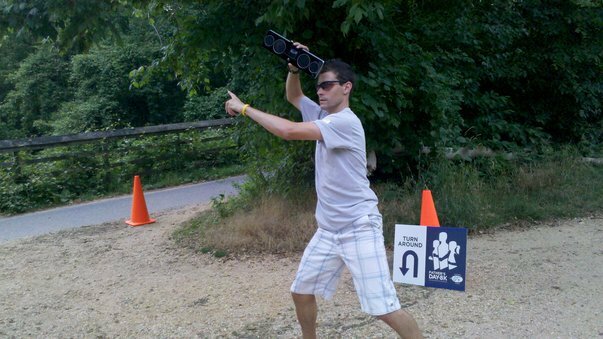 Long-time GRC veteran Jake Klim, also known as the "Red Fox," who led the Club in the 2010 race and has ostensibly "retired," is reportedly "putting all of his marbles" into his clandestine training for the Marine Corps Marathon this coming October. The following video of the 2010 edition of the race, extracted from the depths of the GRC archives with the help of our wise historian, features a triumphant Red Fox, a brief appearance by Outlaw in his pre-GRC days (00:35), and the wise man himself: Charlie Ban. 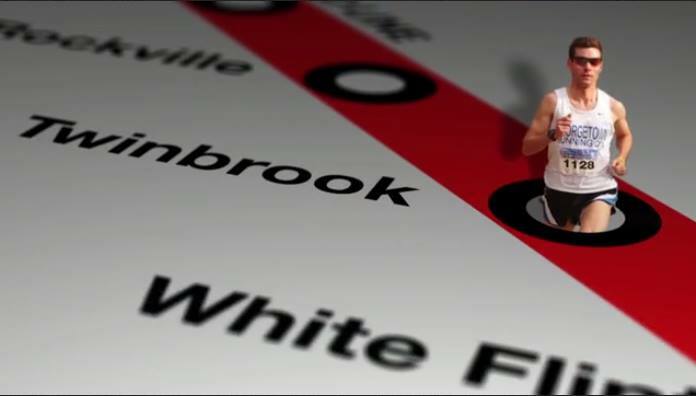 *Video Courtesy of GRC Blog, April 2010 Archives. 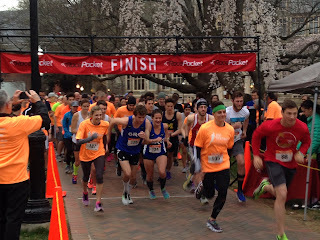 Last year's race was disrupted by an early-morning traffic incident, necessitating the rerouting of the course, and resulting in the first (and hopefully last) ever Cherry Blossom Less-Than-Ten Miler. 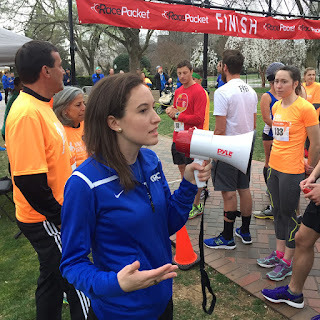 As the throng of tourists along the tidal basin subsides, and many of our runners turn in their first results of the spring, we will have a report of all of this weekend's action featured here as the information becomes available. The team will meet up at the Cleveland Park Bar and Grill (3421 Connecticut Ave NW), as is its custom, at around 2:30 for a post-race party. CORRECTION: An earlier version of this post erroneously reported that Sebi Devlin-Foltz was slated to compete in the Crystal City 5k. In fact, Sebi was up for a more formidable challenge, as he braved the wind and cold in the Cherry Blossom 10 Miler. The GRC blog staff apologizes for this error. Lets Run featured as its quote of the day these wise words from Eliud Kipchoge, who blames the pursuit of money for recent doping scandals in Kenya: "People forget that money cannot be harvested. If you want to harvest the money, you need to plant the seeds. And what are the seeds? The seeds are hard training." Katie Kieran kicked things off up north for GRC at the Maryland Invitational Saturday morning with a second-place finish in the women's 5000 meter run, turning a time of 18:14.20. 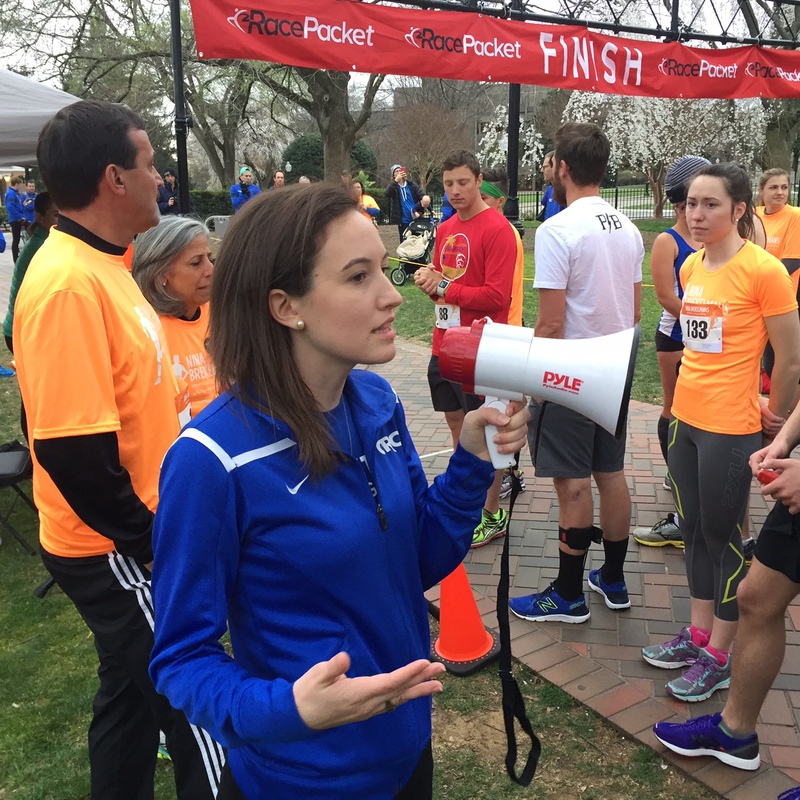 Katie's performance marks her return to the track after an extended hiatus from competition. A few minutes later, Stewart Reich and Kyle Wagener opened up their own 2016 outdoor seasons in the men's 5000 meter run with first and fifth places finishes, respectively. Stewart's time of 15:05.3 was a mere second slower than his PR, run last spring at the Bucknell University Bison Classic, when Stew was rounding into his peak level of fitness. Most impressively, Stew ran alone over the last 2000 meters of the race. It appears that Stew has picked up right where he left off, and his early-season victory by over seven seconds bodes well for his upcoming races. Meanwhile, Kyle made his GRC debut in convincing fashion with a respectable time of 15:18.15. This performance marks the beginning of Kyle's outdoor campaign to best his college marks on the tartan oval. Kyle further demonstrated his bravery and ambition as he fought through a pesky side stitch during the last 800 meters of the race and mixed it up with the hardened post-collegiate veterans of the DMV distance running circuit. Though he was out kicked, Kyle's youth and vigor will surely serve him well as he works to avenge this defeat and establish himself as a dominant runner among the elders. GRC rising star Stephanie Reich blazed her outdoor debut Friday night with a personal best time of 16:43.69 in the fast section of the women's 5000 meter run at the Raleigh Relays, finishing 16th in her heat and 17th overall out of nearly 100 runners. The time tentatively puts her at number two on the GRC all-time list, pending confirmation by the club's interns and administrative officials. It took three years, but Sebi and Chili Balmer were introduced to Dual Ferries — a core GRC workout/investment of half of a day — Sunday. Balmer is weeks away from his first Boston marathon; it was Sebi's first 20 mile run and it was likely Kieran's first time topping 20 miles, too. Coach Jerry Alexander is the mastermind behind GRC's growth and success: the team has benefited greatly from his extensive knowledge and passion, as well as his commitment to his athletes. 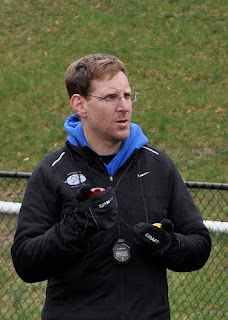 Every week, Jerry brings to the track his experience coaching runners at all levels: from beginners to post-collegiate elites and Olympic hopefuls. Now, Jerry has teamed up with our sponsors at Pacers Running to share his wisdom and insights with the broader running community through a new training blog. 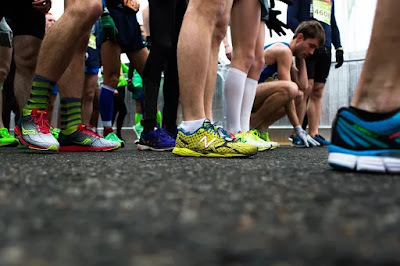 He writes: "My hope is that through this blog, I can help clear up some of the clutter, and provide a consistent, measured approach to help you get the most out of your training and racing. I bring something of a unique perspective to coaching, because I work both sides of the street." Here we are again, talking about hills. GRC took to the streets of DC and Arlington this morning for the Rock 'n' Roll half marathon and the Four Courts Four Miler to triumph over a couple of infamous hills. Pacers refers to the Four Courts hill as "rousing" and "no better thrill." The course features an elevation loss and gain of 232 feet on an out-and-back course with almost all of those uphill feet coming in the final mile, with the finish line perched at the top. Meanwhile, the Rock 'n' Roll runners encounter at mile 6 a shorter, more vertical climb, where a flight of stairs may be a more welcome method of ascending. To add insult to injury, the hill at this year's race also featured wafting scents of grilled breakfast meats from nearby restaurant Open City. 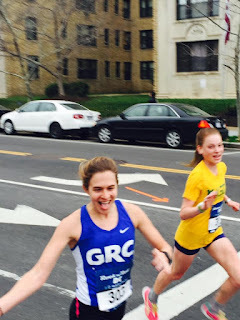 The GRC had a great showing in both races, capturing four of the top five spots at Four Courts and securing the second place spot in the women's Rock 'n' Roll half with Kerry Allen's inspired performance. Also be sure to check out Competitor.com's article on Rock 'n' Roll D.C. where the GRC is prominently featured!